Blade height (at heel): 1.78 in. 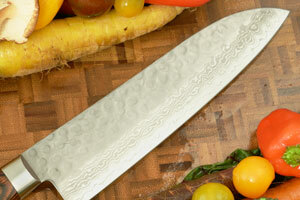 Description: The santoku is the traditional Japanese chefs knife. "Santoku" loosely translates to "knife of three virtues". Some people speculate that this refers to the three cutting tasks the knife performs beautifully: slicing; dicing; and mincing. 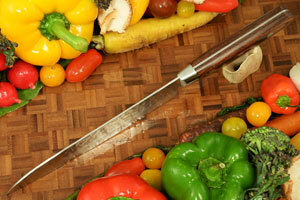 Others have proposed that it could refer to the knife's ability to cut fish, meats and vegetables. Regardless, the message is that this is the general purpose knife used in Japan. 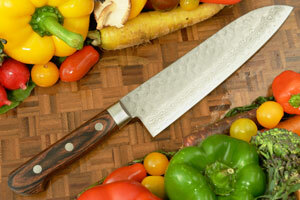 The Santoku has quickly become the new favorite for chefs in the West. The santoku's blade and handle are designed to work in harmony by matching the blade's width and weight to the weight of blade tang and handle, and the original Japanese santoku is considered a well-balanced knife. This comfortable design is a fantastic multipurpose chopper. 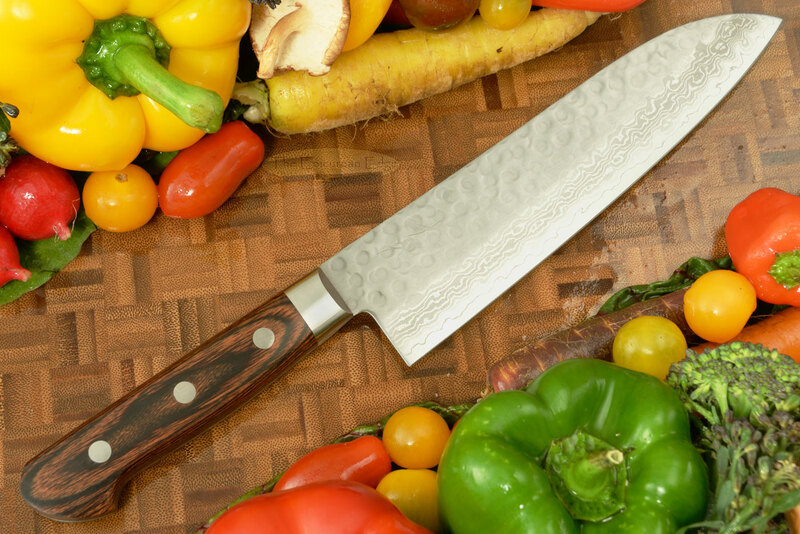 The hammer-finished, damascus blades of these Ohishi knives are designed for the chef who needs a high-performing tool and appreciates a thing of beauty. The ambidextrous blade is formed from a central layer of VG10 super-steel, surrounded by 15 layers of softer stainless damascus. The VG10 stainless steel is hardened to Hrc 60-61 ensuring that the blade will take and hold an extremely sharp edge. The unique tsuchime, or hammer finish, enhances both the look and performance of the knife. Each of the hammer blows produce an effect similar to that of a granton edge - allowing the knife to move more cleanly and efficiently through the food and assisting the food to fall away from the side of the knife rather than sticking. 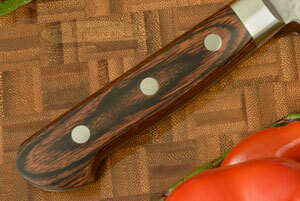 A mahogany-toned pakkawood handle completes the piece. Pakkawood provides strength and stability along with moisture resistance -- a valuable set of virtues in both home and commercial kitchens. 0.234130859375 0.109130859375 234.130859375 109.130859375 Trailer Completed.